MODEL 1855 SABRE BAYONET AND FIRST PATTERN MODEL 1855 RIFLEMAN’S BELT – A MAGNIFICENT SET IN EXCELLENT UNISSUED “LIKE NEW” CONDITION: This matching, complete set of the Model 1855 Sabre Bayonet and the Model 1855 Rifleman’s Belt have been together as a set for many years – perhaps from the time in which they were originally manufactured – and have survived the passage of time in remarkable, “like new” unissued condition. One of the many uniform items and accoutrements the United States Army modeled on the French Army equipment in use from the late 1830’s through the late 1860’s, the Model 1855 Rifleman’s Belt and Bayonet are a very close copy of the sabre bayonet belt worn by the French chasseurs a pied. 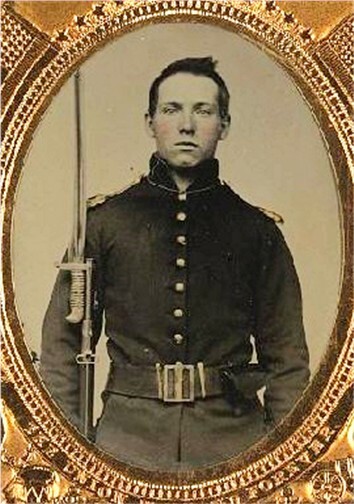 Issued with the newly introduced Model 1855 Springfield Rifle, this belt and bayonet saw service during the American Civil War and is well documented in period photographs. This first pattern, early production belt, is identified by the asymmetrical straps connecting the bayonet frog to the belt – the rear strap being much wider at the top than is the front strap. As to be expected, these early pattern belts are quite rare, particularly in this condition. Showing no signs of issue or use, and virtually no evidence of aging, this belt has survived the years in excellent, “like new” condition. The leather surface of the belt, suspension straps and the frog body is bright and clear with no crazing or flaking and the surfaces are overall shiny and smooth. All of the billets – the closing tab on the frog and the adjustment billets – one on each end of the inside of the belt – are intact, full length, and show no signs of weakness. The two-piece interlocking belt plate, the two brass standing loops and the horseshoe shaped buckle on the frog are all present and have a very nice finish which matches the color and finish of brass hilt on the bayonet. The brass standing loops have a hole at the top which were intended to be anchors for the hooks on the front shoulder straps of the knapsack, and so attached the belt would offset the weight of the knapsack on the soldier’s back. The Model 1855 Sabre Bayonet and Scabbard are in equally excellent condition. The bayonet is full length and shows no evidence of sharpening, retaining its full original form and profile. The surface of the blade is overall bright with only a very few minor pin points of discoloration. The blade is properly marked with a “US” on one side of the ricasso. The brass guard is full form and shows no sign of use or damage and it retains the original polish. The locking catch functions properly, and the catch spring and release button still bear traces of the original case colors. The scabbard is complete and solid throughout its full length with no sign of weakness or having been folded as so many were in use, and with all the stitching intact along the seam. The leather surface is excellent with a bright, shiny surface and no crazing or flaking. Both the brass throat and tip have a nice finish and color, and are full form with no loosening from the scabbard body due to the leather shrinking with age. The rear of the leather body of the scabbard is maker stamped “MADE BY J. I. PITTMAN”, a well known maker of military equipment who was established in New York City as early as 1845.